“Hola, benvinguts a Barcelona! Welcome to the Catalan capital. You may think you have arrived in Spain, but mind you, the Catalans have their very own particular culture that you will not find anywhere else. That’s what makes Barcelona so special. The citizens are very proud of their Catalan roots and so the city is bursting with tradition and culture everywhere you look. 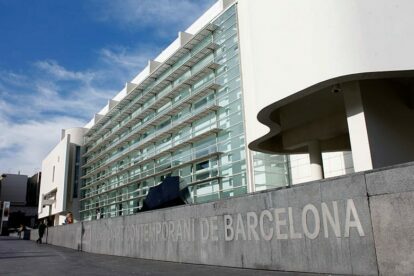 But the growing international community made Barcelona more open minded and it is finding its way to modern trends too. The thing I love about my city is that it is vibrant, bursting with culture and colourful people. It’s a mix between cosmopolitan and laid-back, has mountains and the sea. You get hipster vibes next to full on Catalan tradition. I will give you my recommendations if you are here for a short visit. I have been living here for almost 6 years now, so I tend to skip the touristic sights and choose the alternatives routes. 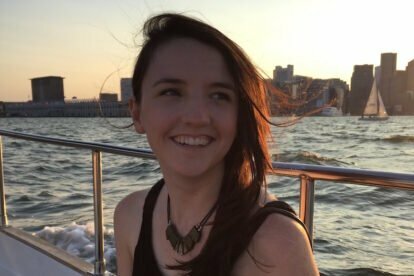 I hope to give you a bit of a local view on this city. However, it may be your first time so I will include the most important touristic highlights here. Enjoy the Barcelona life and emerge yourself with the locals! We start our 48 hours in Barcelona in the Eixample neighbourhood. Eixample is the Catalan word for expansion, and that is exactly what this area is. When old Barcelona bursted out of its city walls, the government assigned architect Ildefonso Cerda to plan the city expansion. And with his own particular point of view he created a 900 blocks grid inspired by cities like New York. Broad streets and residential areas may not sound that appealing to you but think twice. Eixample was build in the beginning of the 20th century, the era of Catalan modernism! That makes Eixample one big open air museum with many beautifully decorated facades of buildings. Modernism is the local equivalent of Art Nouveau and the Catalans take pride in expressing their identity through this art movement. Buildings feature organic shapes, colour and curves, so keep your eyes open and look up! You will see the most beautiful examples of this art movement. Start with a coffee and cake at Cosmo, a coffee bar with a creative vibe. The walls in the back offer space to upcoming artists and is always a amazing display of alternative art. But apart from that it’s just a very nice bar, serving the best coffee, and cakes to die for! After your morning coffee, walk to the most famous street of Eixample; Passeig de Gracia. When you cross Carrer de Balmes, look left and you have a stunning view on the Tibidabo mountain with a small church and theme park on top. Photo moment! Once arrived at Passeig de Gracia you see the glitter and glamour of Modernism, as this was where the elite went all out in the design of their buildings. Also, on this street you find two masterpieces of Antoni Gaudi, probably the most famous Modernism architect. My favourite is Casa Batllo – house of bones. You’ll discover skeleton shapes in this building and the dragon skin roof is inspired on Catalonia’s favourite legend; Jordi and the dragon. A bit further up you will find Casa Mila, also a well known building designed by Gaudi. On the top left of Passeig de Gracia you find Palau Robert, with a nice park behind it (in case you need a rest). It often has very interesting expositions in the building, that are free of charge! Make it a cultural morning and browse around here! If you’ve never seen La Sagrada Familia before, I can imagine you would like to go! This is the moment to do it, as the church is also based in Eixample. You could walk, but it takes you 5 minutes by metro to get there. Save some energy for later today! It will be very busy and touristy but to be fair, even if you don’t go inside, Gaudi’s masterpiece is worth your time. It is still under construction so always changing and full of detail that you keep discovering new things on the exterior of the church. If you think; been there done that or you have some time left, walk up Avinguda Gaudi towards Hospital San Pau. This historical hospital is also completely designed in Modernism style and a beauty to admire! After visiting La Sagrada Familia it is time to go to Passeig De Sant Joan. 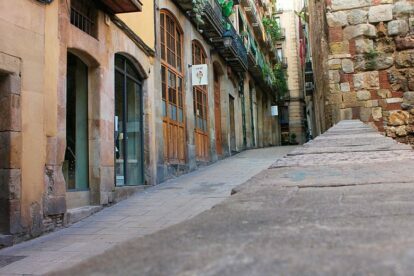 It’s a long street, but go down a bit until you are at the height of Carrer d’Aragó. This is where foodie heaven starts, as this street is hot and happening at the moment. More and more new places open their doors and there is a lot to choose from. One of my personal favourites is Granja Petit Bo. But honestly, all around that little place you will find more delicious lunch spots! Join in with the local hipsters here, because tourists don’t tend to wander off to this street! Once you finished lunch it is time to get ready for a walk up to the most beautiful view points; Bunkers del Carmel. Yes, you could take a bus all the way up there, but you could also have a more active afternoon and take the metro to Guinardó | Hospital de Sant Pau and from there have a nice walk up the hill! Once you have arrived on the top, you will see why we locals love this place. The bunkers are the remains of an anti-aircraft battery during the Spanish Civil War. But it’s not necessarily the bunkers you’re here for, it’s the 360-degree view on Barcelona! Here many locals come for a romantic date, Sunday walk and it is definitely a attractive point for many photographers. You’ll agree, a view like this never gets boring. After this stunning view on the city, it’s time to come down from the clouds again and go back to town. However stay on the upper side of Barcelona and discover the village-like neighbourhood that’s called Gracia. It used to be a small autonomous town until the expansion (Eixample) integrated this area within the borders of Barcelona. That is why this area feels super local and the small town vibe is still present here. There are many interesting local shops to browse on Carrer Verdi and Carrer d’Asturies but we love Gracia mostly for the little charming squares. The most popular is probably Sol, but the most beautiful is in my opinion Placa de la Vila de Gracia. The late afternoon is the moment this neighbourhood comes to life. Locals get together here at the end of the day and gather on the many terraces on these squares. 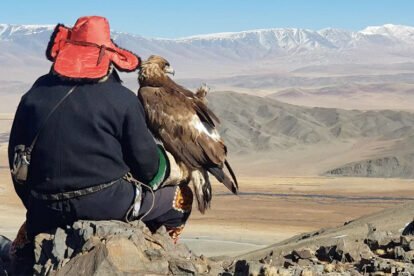 The lively vibe between the groups of friends, families and neighbours in this area is contagious and will surely leave you with a smile while you enjoy a beer and a snack after the long walk up to the bunkers. Day 1: 19:00 – ??? We leave Gracia behind and go back down to the old city. Tonight it is time to discover Raval, or as we call it “Ravalear”. Raval used to have a bad reputation, the dodgy area of the city you should not enter. But it has already passed the stage of ‘upcoming’ and is now becoming quite popular. And although it is still a bit edgy, trendy and traditional places go hand in hand. And this is exactly what I love about Raval; old and new come together here. Start at Las Ramblas and from there enter Raval through Carrer d’Elisabets. This old street leads you to Placa del Angel where you see the gorgeous contrast between historical buildings and modern architecture. 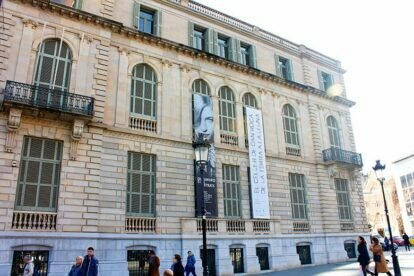 The big white building is MACBA, the museum for modern art. The square is the domain of skaters, who give the alternative twist to this area. Known as one of the best vegetarian restaurants in town and joining in on the superfood trend, is Flax and Kale. This beautiful designed place gives you the healthiest menu in town and as a non-vegetarian I can promise you; it’s all amazing! 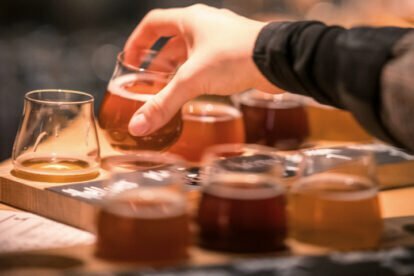 Another popular place is Fabrica Moritz, an old beer factory of the Barcelona beer brand Moritz, where you can have delicious tapas apart from the best beers in town. 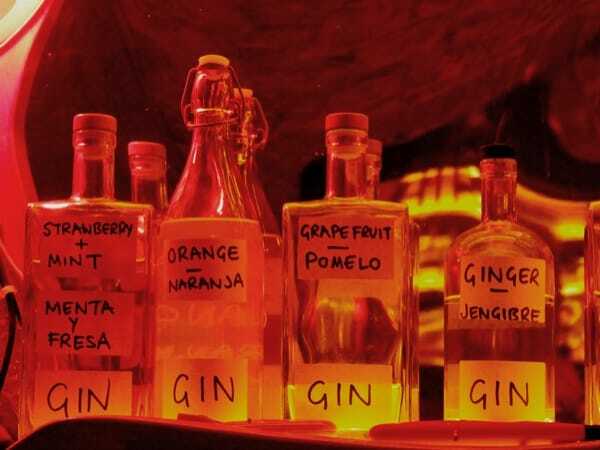 After dinner it is time for a bar crawl, because Raval is the best place for that if you’d ask me! 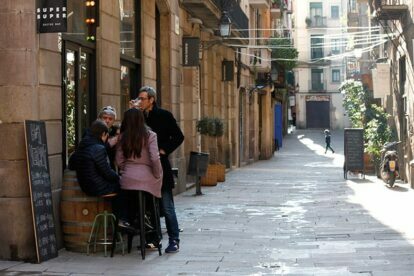 Especially Carrer de Joaquin Costa has a very high density of bars. You could try to visit all of them, bottom to top of the street. Might be a bit too much though, so I’d recommend Betty Ford’s or 33|45 for some drinks with the edgy yet trendy crowd of Raval. 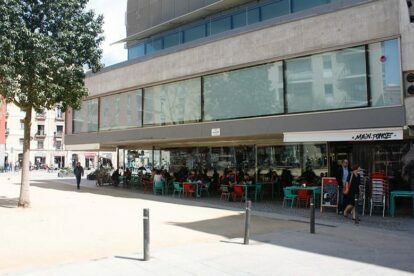 If you prefer a terrace, check out La Monroe, next to the Filmoteca de Catalunya. 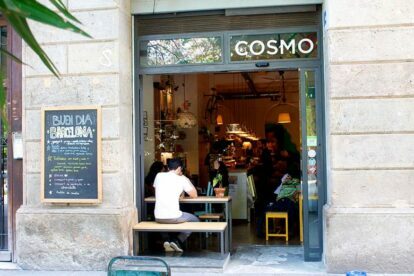 This terrace offers you a view on the colourful locals of Barcelona and the best nachos in town. If your a cinema fanatic, check out if the Filmoteca has a nice classic one programmed; the movies are screened here in their original language. Start your day in the old fishermen neighbourhood Barceloneta. This is the area with the city beaches, so it tends to get very crowded during the day. That’s why I prefer to walk down the boulevard here in the morning. When you walk down Passeig de Joan de Borbó, you pass the luxurious yachts on your way to the beach. 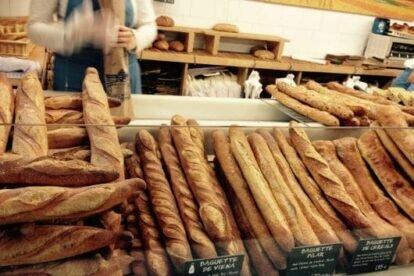 Make a pitstop at the best bakery in town, Baluard, to pick up a small snack for breakfast with a view. 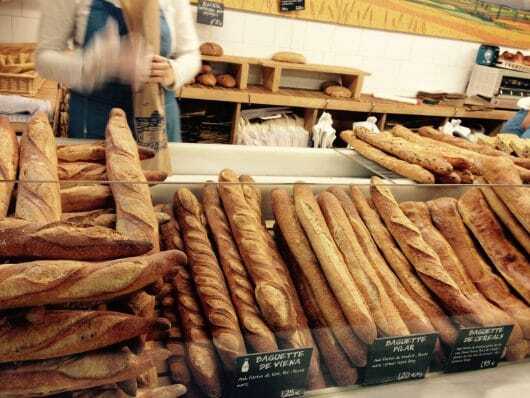 Be careful though, I tend to end up with half the bakery in my bag because it’s so hard to choose. Once you picked up some take-away breakfast, walk down to the beach. My favourite walk is along the coast towards the W hotel. You can’t miss it; it’s the hotel shaped like the sail of a boat. 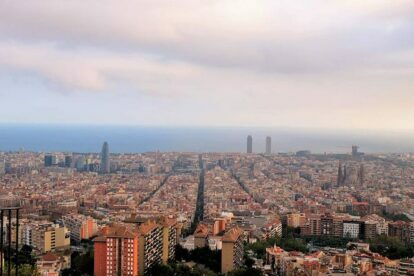 When you walk to this far end of the city beach, you will be treated with a breathtaking view on Barcelona’s coastal skyline. The perfect place to enjoy a breakfast picnic! If you visit in summer, take some time to enjoy the early summer sun and do some sunbathing here. But even in colder seasons it’s a beautiful spot to sit down and relax! After this refreshing morning walk I’d think it’s time for some action. 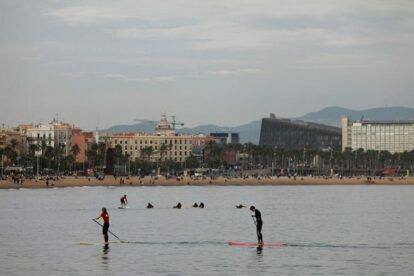 Walk back to the busier part of Barceloneta and head to the surf shops on the boulevard. Here it’s time to rent a paddle surf board and go out on the sea! If it’s cold, rent one in the shops so you can also get a wetsuit. But if you visit in the warmer months, go to Surf House and ask for one of their boards. When you go for brunch/lunch here they allow you to do a 45 minute paddle for free! And yes, you will have gotten hungry after some active paddling on the Mediterranean see! Have a late brunch or early lunch, as you prefer, because both menu’s at Surf House are delicious and healthy for a good recovery after this active beach morning. It’s time to leave the beaches and head back to the city centre. Try to avoid the tourist crowds on Passeig de Joan de Borbó when you walk back up and wander through the small streets of Barceloneta. 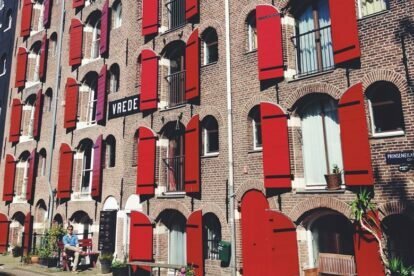 The inner part of this neighbourhood maintained a lot of its character and many old locals can be found enjoying the sunny weather in a chair in front of their house. It will surprise you how local the vibe of these streets is in this touristic area! You leave the harbour behind you as you head into the Gothic neighbourhood. It’s the heart of the old centre and a labyrinth of small streets. I still get lost here every now and then, but always get surprised by the historical beauty of the buildings here. Enter “ El Gotico” through the streets behind the post office and allow yourself to get lost a little there. Streets like Baixada de Viladecols show you the typical beauty of this place; cosy squares and left overs of the city walls are all around. When you arrive to the big street, Carrer de Ferran, turn towards Placa Sant Jaume, where the Generalitat (autonomous government) building and City Hall tower over the big square. Keeping the Generalitat on your left hand side, move further up into Gotico. Here you are basically behind the huge Gothic cathedral. Although I can imagine your curiosity to see the facade of the cathedral, don’t rush through these streets. First of all because the acoustics in the streets around the cathedral are very special so you might find many street artists singing or playing. Some amazing, some not that great, but all part of the city culture! 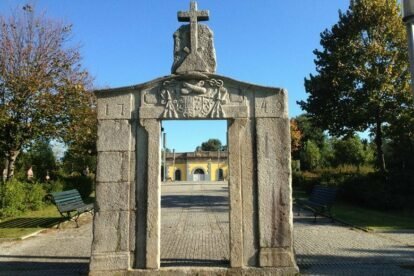 Second of all because you don’t want to miss out on a hidden treasure, placa Felip Neri. Take a left turn on Carrer de Sant Sever and then turn the first street right and you enter one of he most picturesque squares of the city! The church on this square is still heavily marked by the bombs of the civil war. Not many know to find this square, so it’s often a peaceful oasis in the touristic heart of Barcelona. It’s time to continue towards the front of the cathedral. The square is lively and the dramatic backdrop of the building is a hotspot for selfies and photos. It’s also beautiful from the inside, containing even a little orange tree garden, but it can get very crowded if you want to enter the church. Still tempted to go in? Try one of the side entrances, there’s usually no queue there! The upper part of Gotico, from the cathedral towards Placa Catalunya, is the main shopping area. Not much history going on there, so I would advise you to leave Gotico behind here. Walk a bit further up along Via Laietana and cross the street to enter Carrer de Sant Per Més Alt. Here you can admire Palau de la Musica, a true modernism treasure. 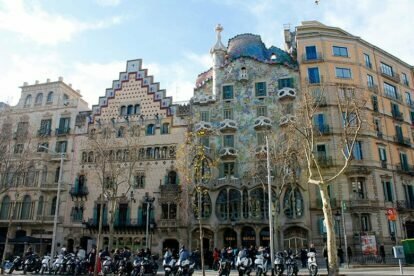 Barcelona is famous for Gaudi, but the architect Domenech i Muntaner is just as well known among the locals and with a reason; his buildings easily measure up to the architecture of Gaudi! Tired? 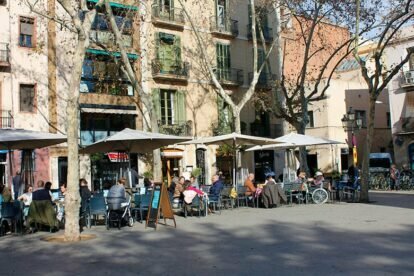 You can enter the small street opposite to the Palau and meet up with the creative crowd of Antic Teatre for a beer under the welcoming shadow of the big tree in their garden. 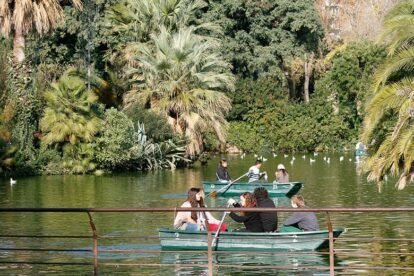 When you regained your strengths, walk further into the Born neighbourhood and head towards the famous Parc de la Ciutadella. Since today the brunch was early, you’re probably hungry. Save the tapas for later, but go for some take out food. Around the park are many delicious options such as Pim Pam Burger, Vietnamita or La Taguara. Get yourself a tasty picnic at any of those places and walk into the park. After the siesta in the park it’s back to do some more exploring. 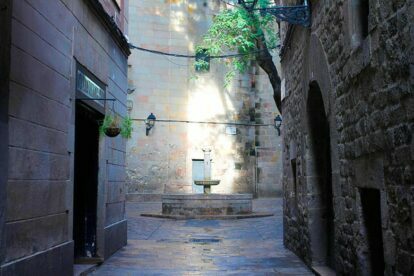 Leave the park and walk into El Born, another part of the old city where history is all around. 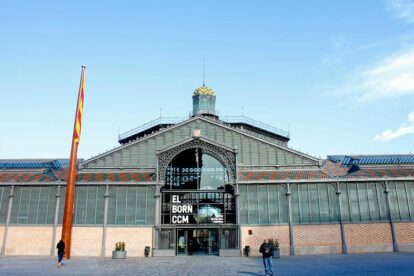 When you walk up to the central part of this neighbourhood, take a short cut through the beautiful El Born Centre de Cultura. It used to be the main market of this neighbourhood, designed in the style of iron architecture. Nowadays it’s a cultural centre and you can see some archeological remains of the medieval buildings of the city. When you exit on the other side, you have arrived to the lively centre of this small neighbourhood, Passeig del Born. 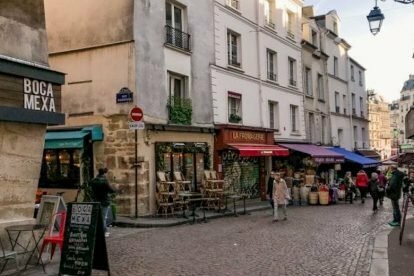 There are many bars here, but first wander off into the small streets because this is the best neighbourhood for original and cute small boutiques like La Comercial or Henna Morena. Shops are open until 20.00h or some even until 21.00h so plenty of time to discover some beauties and shop some souvenirs. Don’t forget to visit the Santa Maria del Mar, in my opinion the most beautiful church in town. It was build by and for the poor people of Barcelona, as the rich elite used to go to the Gothic cathedral. You can still see the builders visible on the doors of the church, carrying the stones on their back all the way from the Montjuic mountain to El Born. Inside the church is impressive; simple but beautifully decorated. Many weddings take place her, you might be lucky and catch a glimpse of it! So again, dinner time in Barcelona does not start earlier than 21.00h. If you want to go for tapas, I can recommend Bormuth, a traditional looking bar where the young city crowd comes together for a beer and some tapas. But El Born offers a wide range of world food. Why not try something more international like noodles at Red Ant or a good old Italian pizza at NAP? Yesterday you covered the bars in edgy Raval, today it’s time for a fashionable night out. Born is bursting with cocktail bars and so don’t leave the neighbourhood but browse through the streets after dinner for some fancy drinks. One of the best cocktail bars in the world, as they actually have been awarded, is Paradiso. A fun experience, as you enter this bar ‘ speak easy’ style, through the door of the fridge of a Pastrami bar. This is real upper class cocktail, and the drinks are not cheap but very special! More a no nonsense cocktail type? 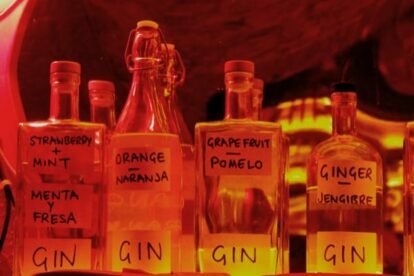 Then go to Rubi for some home brewed gin-tonic or cross over to Gotico and go for drinks at Milk. This cosy bar has all the classic cocktails on the menu for a great price and although no official awards have been won, in my opinion they serve the best cosmopolitan in the world! These are only a few of the many cocktail bars around, but they are all open until the early hours so you have plenty of time to try a few! More? Check our Barcelona blog or app!